We all make mistakes, but there are mistakes and there are monumental blunders. In the instance of supporting, endorsing and promoting Dani Cappri (real name Daniel Boylan) of Gudwulfs ROC I took folly to previously unexplored depths. Recently seeing the disturbing pictures of conditions where his ‘rescued’ canines were kept turned my stomach as did allegations of a dog’s throat being slit there. *See the SPCA report below. My mother often refers to what she calls “squealing feelings”. I am deeply ashamed that I did not listen to my squealing feelings about Dani. I ignored them because he was ‘such a great guy’. I would tell anyone willing to listen that he was the finest quality human I had met in a long time. On the face of it Dani seems remarkable, a devoted father to his 2 young children, a person who claims to be absolutely dedicated to animal rescue, specifically canine power breeds such as pit bulls. The part which I still struggle to get my head around is that he is gifted with animals, you can’t fake that BUT I have now come to question whether he has abused that gifting to achieve self serving ends. Let me start at the beginning. Toward the end of 2015 I set about finding a dog trainer to train our disobedient dogs. I found Dani then operating as Canine Cappri. His ‘dog whispering’ ways so impressed me on our first meeting. On his next visit he arrived with a folder detailing our dogs behaviour and areas to be addressed, particularly Floppy’s depression resulting from the death of her friend Liquorice. 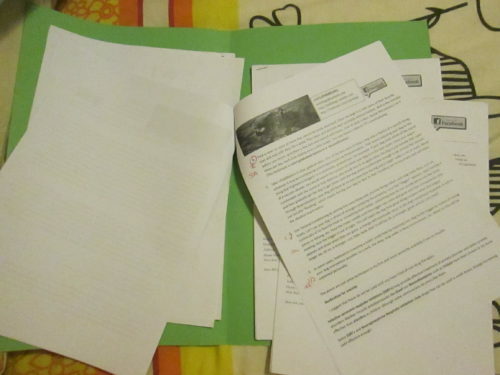 With that folder came the first squealing feelings, his documents suggested anti-depressant medication but when reading that out to me Dani expressed the opinion that he does not advise meds. The thought crossed my mind that he had printed someone else’s work off the internet, and this may not have been his carefully compiled personal report as claimed. Of course because I thought that he was the berries I squashed that nasty thought. On the first day of ‘training’, Dani asked for the R900 fee as upfront payment. After paying, very little in the way of training took place. The only thing that my dogs learned from him was not to fight over food at meal times. My friend Stacey also paid up front for training and he never really started their training let alone finished. Despite untrained dogs we became friends and I really liked him. I believed that he had a heart for animal welfare. He looked after our animals several times when we went away (for a reasonable fee). I do however regret leaving my house keys with him. I regularly cooked meals for him and his children. During many chats over coffee, I picked up numerous lies and exaggerations, generally while he spoke question marks would pop up constantly in my mind. I ignored them because he was ‘such a great guy’. Dani is quick witted, intelligent and humorous. His ready smile is disarming. Many of his tall stories were almost laughable, and he gained nothing from telling them. One of many such tales was the one about Anacondas gobbling up wildlife on his relatives farm. When I queried their non indigenous presence (which would surely make news headlines) he said that special poison toads were being brought in to kill them. Instead of being angry at the insult to my intelligence, I laughed it off. He sold me dog treats which he claimed to have baked, they were identical to those made by our local Spar, I could have challenged him, I didn’t. He told me that he couldn’t register to vote in elections as his ID book was stolen, weeks later I took him to get a new SIM card , he took along his ID book (had it been replaced, it would have been the new card type). These are just a few of many examples of his casual relationship with the truth. 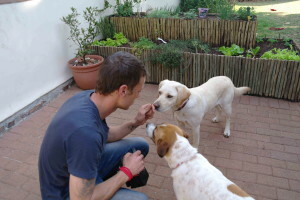 Dani claimed to be a few years into veterinary studies through Onderstepoort. I very much doubt that this strict educational institution would allow him to study on the purported flexi-time arrangement which he claimed they supported. I have not checked out the Onderstepoort claim. My daughter and a friend both adopted cats from Dani, in both cases they were told by Dani that the cats were female. A quick look at my daughter’s cat led me to say to her “your girl cat has balls, I doubt that she is a she”, both cats turned out to be male. Dani rescued a street dog outside the premises of a financial services company, he nursed Sport to good health. As a result the financial company owner offered to set up a trust and NPC (non profit company) at no cost. Dani needed another person to sign as director and trustee. I offered to do this without thinking through the seriousness of signing legal documents in taking this on. Last year I had far less contact with Dani, and he moved away from Boksburg. It began to trouble me that I knew nothing of the day to day running of Gudwulfs. 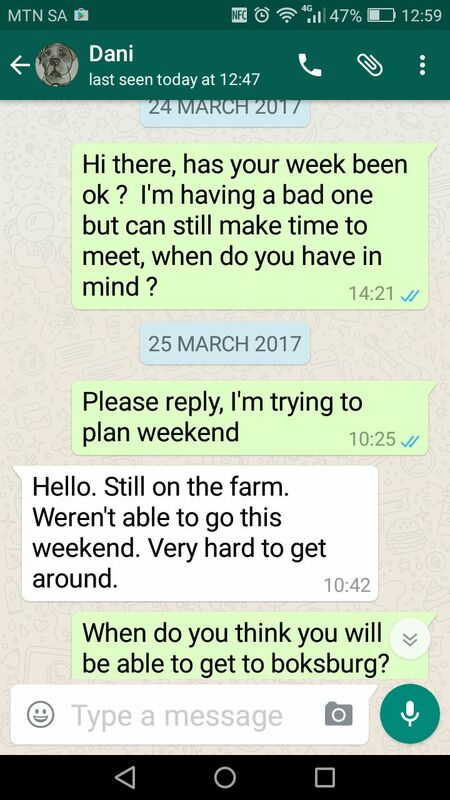 He looked after my dogs and chickens in December but he let down my friend Abbey, after making arrangements to care for her dogs he ignored her calls until she called from a different number. She was left having to find last minute kennelling at great cost and stress. In January I started trying to extract myself from the trust and NPC, through e-mail resignation notices, but my resignation was not processed. After a conversation with CIPC, who confirmed that I was still listed as a director, I was under the impression that a meeting needed to be held to formalise my resignation. I sent many messages to Dani requesting a meeting date but these were ignored. Eventually he said that we could meet on the weekend of 25 March. 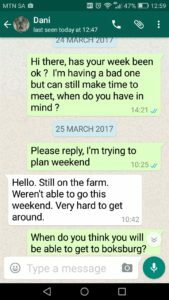 When once gain I tried to confirm the meeting, he replied that he was stuck on the Onderstepoort farm more than an hour’s drive from Boksburg. Half an hour later I bumped into him in Mica hardware in Boksburg. I am in no position to comment on the SPCA issues or the conditions under which he kept dogs as I have not seen this with my own eyes. I only saw the Boksburg premises which were acceptable. 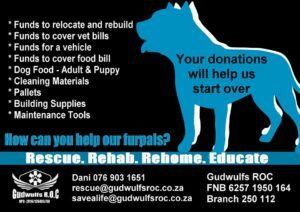 I do however feel that I will never again support a rescue organisation who’s credentials and premises I have not seen and verified. For instance donations made to ‘Gudwulfs’ go into Daniel Boylan’s personal bank account, the trust and NPC never opened an account (thank heavens or I would be linked to his financial dealings), the account details which he gives for Gudwulfs are his own and this can be verified with FNB who hold the account. I have a copy of the bank document with account details. There are other very disturbing facts which I cannot share here as they have been told to me confidentially and others which cannot be shared without proof. I feel like an absolute idiot for falling for Dani’s bs but I have have learned a few tough lessons. I really need to trust those squealing feelings. After being lied to so much by Dani, I now question absolutely everything that comes from him. I question whether the focus on power breeds could be a front for sinister activities. I question how he makes ends meet, he claimed to spend 200K on his one move, how does a person who hardly did any dog training get that kind of money? The maths does not work. The biggest lesson for me, is never to accept or tolerate being lied to even if the lies are ‘harmless’ to lie is to show absolute disrespect for the person whom you are lying to. If you think about it, every crime has it’s roots in disrespect for fellow man from theft to murder. As a parent this reinforced how absolutely imperative it is that children must be taught that lies are never acceptable. This post was very hard to write, but previously I wrote 2 blog posts supporting and endorsing him (now removed) I am responsible for misleading people as I was misled and I have to remedy that now, my conscience will not allow otherwise. To those who have dealt with Gudwulfs and Dani I would appreciate if you comment below with your experiences. NOTE : Gudwulfs facebook page has changed to Gudwulfs Projects. Please accept or apology for the delay in responding to you personally. We have been inundated with cruelty complaints over the last few days, likely owing to the long weekend. We have limited resources and since we have to prioritise our time to give preference to investigations, reporting under these circumstances takes a little longer. The above property was inspected on 24 April 2017 at about 11h30. A comprehensive inspection was conducted by three Tshwane SPCA Inspectors namely, Senior Inspector: Carlos Fernandez, Inspector: Andrew Kekana and Inspector: Mishack Matlou. 1. At the time of inspection the Inspectors observed 19 dogs being kept in various camps. Some of the dogs were kept in pairs and others individually. Four Bull Terrier-crosses were kept together and six dogs were kept in cages of about 2m x 1.5m respectively. Two dogs were roaming in the house, and the rest were being kept in camps of about 6m x 4m. 2. The Inspectors observed that the camps had adequate shelter and that provision for water and food was made. 3. The Inspectors further observed that two dogs (black and white Pitt-cross and a brown and white dog) had healed injuries and the owner provided a Veterinarian’s report as to the care and treatment of the relevant black and white dog. The injuries to the brown and white dog (belonging to the owner) also occurred some time ago and have healed after receiving veterinary care. Both dogs appeared in good health with no obvious signs of physical trauma or neglect. 4. At the time of the inspection no other injured or sick dogs were noticed. However, the Inspectors observed that the dogs all appeared to have fleas. The owner stated that the area is infested with fleas and they cannot control them as they are everywhere in the surrounding grounds and not only on the dogs. The Inspectors noticed various parasites control products being used on the property, but the owner indicated that the products only provide temporary relief. 5. The owner stated that he is working to relocate the dogs (without owners) to a suitable environment and stated that some of the dogs have owners. The owner stated that he is in contact with the owners of the dogs to arrange for their relocation. 6. The Inspectors then addressed the owner on the provisions of the Animals Protection Act. The Inspectors expressed their rejection of the owner’s initial relocation plan as there was not clear indication given as to when this plan would be executed. 7. The Inspectors issued the owner with a deadline to enforce the relocation of the dogs, and to provide the Inspectors with a detailed ledger of all the dogs on the property, and their relocation details and addresses. The aforementioned directives where issued in the form a warning to the owner. 8. The owner accepted the warning and further agreed to ensure that the dogs are all assessed by a veterinarian during the relocation process. Owing to the history of this matter the Inspectors advised the owner to close the shelter. The owner subsequently complied with the directives of the warning. 9. The animals were attended to by veterinarians during the relocation process. 10. Inspector: Andrew Kekana and Inspector: Mishack Matlou and Trainee Inspector: Mpho Lebethe, conducted a follow-up inspection at the property on 28 April 2017 at about 10h00. The Inspectors found no dogs on the property and the owner informed the Inspectors that the dogs had been relocated to other suitable premises. 11. In this regard, the Inspectors were provided with a detailed ledger of the new locations of the dogs.Further location inspections were done and no welfare concerns were noted. Going forward follow-up inspections will be conducted at the various relocation premises (with the assistance of the relevant SPCAs) to follow-up on the welfare of the relevant dogs. 12. As to the Facebook matter; we laud the public for the valuable contribution they make in the fight against animal cruelty, but we ask that due process be respected to ensure that offenders can be brought to book, on proper evidence. 13. The posting of photographs and commentary on social media (in this case Facebook) may provide would-be offenders with an opportunity to rectify the apparent cruelty by for example, cleaning the premises / doing away with animals etc. 14. However, we know that the posts were made with the best of intentions to aid the relevant dogs and we thank you caring for these dogs. Please be assured of our best efforts at all times. I found a shared post on Facebook for a puppy that was “rescued” by Gudwulfs R.O.C and was up for adoption (December of 2015). I contacted Danny and he said we could have the Male Puppy Yellow Labrador (named Chase) for R800.00 with an additional fee of R600 for training, he gave us his address in Boksburg and told us we could collect him on the Saturday. (I did find it odd that he said we could just take him and no property inspection was done first as the SPCA usually does). When we arrived at the property in question it appeared that he was residing in the garden cottage (we didn’t ask any questions other than where od the dogs sleep, he told us the dogs lived in the garden cottage and that they were spoilt rotten and he provided them with the double bed – however there were small children watching TV in this flat and it appeared that it was in fact his residence and that the bed belonged to him and not the animals). There were no kennels outside or dog baskets inside – Also there was a lot of debris laying around the premises and a blow up pool was the only source of water I noticed that was provided for the all the dogs. He told us he would need to train Chase and it would be an extra R400 – he would come to our residence to do so, we told him that we reside in Springs and he said then it would cost R600 and not R400 due to the distance, so we paid the total amount of R1400.00, he gave us forms to fill out and told us he will bring the copy when he comes to our house to train Chase. When we got home I noticed that Chase was riddled with what we presumed was flees, there were so many that you could see them crawling on the outside of his coat. It took us two weeks to get rid of these flees even though he assured us that Chase was dipped the day before, finally we managed but only after we had purchased the Bavaria tablets to give him. Chase was also rather skinny and considering he had the pup for over two weeks I would have expected him to be healthier. A week went by after the adoption and Danny did not arrive to train, we called him, he said he assures us he will be there next week, he couldn’t make it this week. The week after same thing, he would ignore our phone calls, eventually after 2 months we manged to contact him and ask him when will he be providing the dog training we paid for, he simply said he won’t be! I then asked for my money back and he said “sorry I don’t have it, and won’t ever be able to give it back – you can step in line like everyone else or take me to court”. This was upsetting because he offered a service that he knew he had no intention of providing. This was not something I would expect from someone who has been entrusted to rescue animals and in my personal opinion, I think he does it for his own benefit and not the benefit of the animals or they would be residing in better conditions and he wouldn’t be stealing from honest people who would rather try help organisations that rescue abused animals to give them a better chance than to buy from a pet shop. Thank you for sharing your experience, I’m sorry to hear that you were also conned out of your money. Thanks for the blog Ursula, I’m so sorry to hear that good honest people are being conned into these situations, but you do not have to apologize, your heart is in a good place and you should go easier on yourself, really. I too had an issue with Dani, fortunately for me, he dropped me before it cost me anything more than some stress and last minute running around and costly kennelling. Keep supporting people who need it, they wont all let you down. How is it possible for these concerns to carry on taking people’s money meant for good causes? Is there not a way that they can be blacklisted to prevent them from operating. I’m worried about the animals, as I have seen pictures of their kennels, and it is disgusting and heartsore! No water, no food, faeces not been cleaned up for a while, animals in bad conditions. Please, is there a way we can stop this and only support the organizations who truly deserve this. I’m sorry I don’t know the answer to your question but maybe someone with more knowledge will be able to comment. I have also had dealings with Dani Capri. My grandson got involved with him as he was interested in helping him with the rescue of the dogs. I’m horrified to read of what you have been through. I really hope that you manage to recover some of what you have lost. Chantelle here from Gudwulfs. I have been aware of your blog post for a few months now. I read it once. I have, however, been made aware that you have updated your blog with our newest Facebook page. I cannot let this defemation of this organisation continue any longer. Please respond with your contact details (email and cell number) so that I can get my attorneys to deal with this matter from here on. Dear Chantelle, Daniel has all of my contact details, none of which have changed unless, they were burned in a fire, stolen in a robbery (reasons I was told that previous documents were not available) or perhaps a dog ate them? Hi. So very sorry to hear about your dreadful experience. If anyone has a website address for his shelter I would appreciate it as it appears that he is marketing himself as an accredited/certified behaviour consultant and this is a fraudulent claim as he is not a member of the registration authority that he claims to be a member of. Namely the Animal Behaviour Consultants of Southern Africa. This is rather disturbing as it could negatively affect those of us who have studied for many years and help the public with their animals using only the latest non-confrontational, scientific based methods. I have no idea of his training or behaviour modification methods, so cant comment, but can say there are lots of charlatans and snake oil salesmen out there taking the publics hard earned money. Here is a link to the Animal Behaviour Consultants of SA where the public can find an ethical behaviour counsellor who has to abide by a strict code of ethics which I will copy below. ABC of SA Code of Ethics. 1. Offer services for which they are suitably qualified, in a professional manner. If a case is beyond a consultant’s scope of expertise or experience, it is expected that consultants refer such cases to a suitably experienced or qualified colleague, or work in liaison with such consultant. 2. Treat clientele with honesty, confidentiality, understanding and compassion, and ensure the client is not misled or exploited. 3. Treat the animal (where applicable) in liaison with the referring veterinarian, and be aware of any potential behaviour problems that may be associated with a physiological cause. When indicated, prior to a consultation, the consultant should recommend that the client consult with their veterinarian in order to rule out or confirm such a possibility. 4. Ensure that the behaviour problem is thoroughly investigated and the animal concerned fully evaluated. 5. Offer advice, which is practical, and appropriate for each individual case. Such advice should be based on practical, up to date scientific applications and practices. 6. Avoid any method of treatment, equipment or techniques that inflict physical pain, intimidation, and/or cause undue psychological/physiological distress. 7. Use methods of behaviour modification and/or training that do not contravene any section of the Animal Protection Act No 71 of 1962. 8. Encourage responsible companion animal ownership and education, and promote awareness of animal behaviour wherever possible. 10. Become familiar and liaise with all relevant aspects of animal industry. 11. Maintain a professional relationship with other organisations in the same field, and encourage positive interaction and cooperation between organisations, and treat all professionals, regardless of affiliation with respect. 12. Avoid any actions, which may discredit the A.B.C. or any of its members. Thank you for the information. I have just looked at the Facebook page for “Gudwulfs Projects” and see that there is no longer a link to a web page. The last I heard was that Daniel was not a member of any accredited body, I doubt that this has changed.